Hashtags Come to Facebook: #LoveIt or #HateIt? 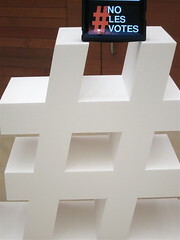 Hashtags are an incredibly useful way of discovering information to some. To others, they are an infernal annoyance that should remain confined to Twitter. No matter what you think, your online life is about to become full of them. No one has even heard the term “hashtag” before 2008, and if they somehow did it had nothing to do with current usage of the word. Twitter users, having only 140 characters to work with, would add a “#” to important keywords in their tweets for emphasis. Twitter’s decision to start hyperlinking hashtags to search results back in 2009 has really pushed them into prominence. Since then, both hashtags and the abuse of them became commonplace online, and they were even being used in places where they were bereft of functionality — like Facebook. While users still added hashtags to their posts, they have never been clickable. This prevented them from serving as gateways to more information or expanded conversations. As time has passed, the various platforms have bowed to the community’s desire for working hashtags, and they have been allowed on the top-tier social platforms such as Google + and Flickr. Until now, Facebook has been the conspicuous holdout. The rumored Facebook-approved hashtag has arrived, and instead of complaining about how Facebook will bring Twitter’s much loathed, overused punctuation to a News Feed near you, it’s about time we all embraced the organizational simplicity and enhanced search options now sticking to your wall. Because Facebook is making the hashtag useful again. ‘Starting today, hashtags will be clickable on Facebook,’ reads the official announcement from the social network. But really, Facebook users already employ the hashtag — and all of your complaining won’t change that. As the company’s own post explains, its clickable tags work pretty much exactly like on Twitter and Instagram, the Facebook-owned service that already has a vibrant # culture. As with any major change, there will be voices raised in both praise and vilification. On a larger level, this may well help improve Facebook’s GraphSearch, which is generally recognized as underperforming. I would be willing to wager that one of the factors behind Facebook finally buckling on this issue was the hope that introducing crowdsourced tagging like this will help improve the platform’s relevance.